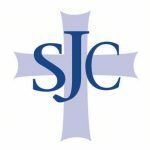 This week is Christmas Spirit week at SJC! Students are encouraged to bring in $5 during this week. All proceeds will go to St.Vincent DePaul to help the needy this Christmas season. Monday: Christmas Hat day, Tuesday: Ugly Christmas Sweater day., Wednesday: Crazy Christmas Hair day and Thursday is Christmas PJ day and Movie Day!